Andean mysticism can be felt throughout every part of Cusco and the Sacred Valley, but most visitors seem to experience only a glimpse into this unseen world. Still, many are drawn to the area’s energy, intuitively knowing a deep connection to the universe, the planet, the mountains and nature lie somewhere below the surface. Many who wish to have an immersive experience, often just scratch the surface, encountering a tourist ready-made version of a thousand year old traditional ceremony. These types of ceremonies can be found at the tourist offices and remind me of the “luaus” I once saw in Hawaii (feeling as superficial as Disneyland) geared towards entertaining the eager consuming tourist. My mom and I have been immersed in the Peruvian culture for several years now. Part of our desire for living here is the intention to dig deeper into the culture, understand the history and explore the traditions. We’ve explored much of the history though the archaeology, and experienced the mysticism through the traditions. Last yearm my mom explored one of the sacred pilgrimages by attending the Qoyllur Rit’i festival, high in the Andes. She made her way to the Sinakara Valley along with 10,000 other pilgrims to experience the sacred Snow Star Festival. 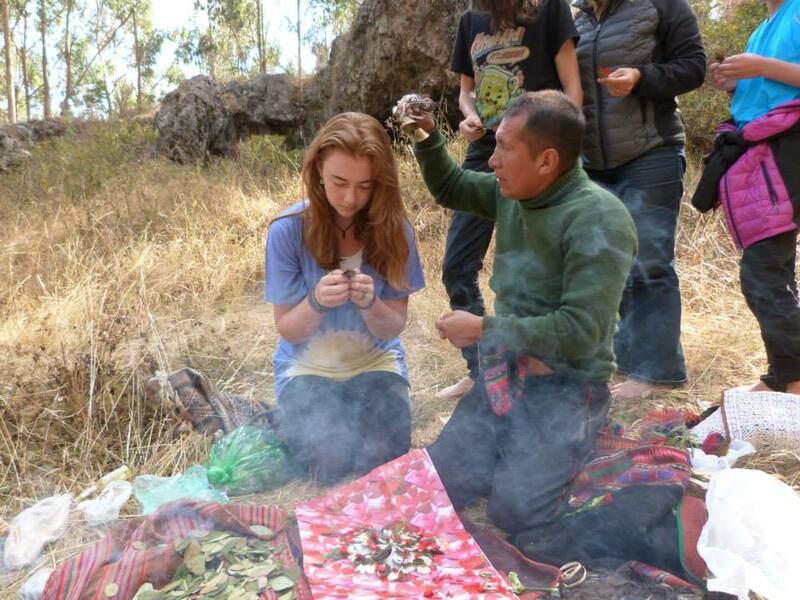 As a result, I was honored to meet Cesar, a local healer, shaman and Andean mystic who was her guide for that journey. Recently, we had several families visiting Cusco and so I arranged a family “Despacho” ceremony for us all to experience. A despacho is a ceremony honoring Pachamama (mother earth), the sacred Apus (mountains) and the spirit in all of nature. The Andean people believe all are connected and as a way to show continuing appreciation and gratitude for the crops we eat, the water we drink and the land we live on they make an offering. The offering is a gift, charged with intention, love, reciprocity and reverence, unifying all living energy of the physical and unseen universe. Despacho ceremonies are traced back to the Q’ero peoples of the Andes. High up in the Andean mountains of Peru lives a small community of farmers, weavers and medicine people known as the Q’ero. The Q’ero sought refuge in “villages in the clouds” following the invasion of Peru by the Spanish Conquistadors almost five hundred years ago and remain there to this day. They were “discovered” in 1949 by the anthropologist Oscar Nunez del Prado, who led the first expedition to the Q’ero villages in 1955. The medicine people within the Q’ero nation are known as “paqos,” which means “priest or mystic” in Quechua, the language of the Inca. The Q’ero paqos are credited with preserving and maintaining the healing knowledge, ancient prophecies, beliefs and traditions of the Inca – and the knowledge of the civilizations which came before them – via their oral tradition. Over the years, they have selflessly shared their traditions and wisdom with seekers of knowledge from all corners of the world. The Q’ero do not see themselves as separate beings with separate identities as we do in the West, instead they see themselves as one with each other, one with nature, and – as with most indigenous cultures – also one with God. In fact, they are so ego-less and focused on the collective spirit that they do not have a word in their language meaning “I.” Their main philosophy is to practise “Ayni,” which means living in reciprocity, balance and harmony with the Earth, with nature and with each other. Ayni is the practice of giving before taking, of fairness. For example, when harvesting their corn crops – which they do together as a community – they search to find the two most perfect ears of corn. These are then buried ceremonially, as a thank you to “Pachamama,” Mother Earth, for their abundance and as a prayer for future abundance. Thus they gift the most prized ears of corn back to the Earth, as a thank you and in order to remain in balance and harmony with Pachamama. You can read more about the Q’ero people or offer your support here . Traditionally, the Q’ero Paqos perform an offering to Mother Earth known as Pachamama, and to the sacred Apus, the mountain spirits in a ceremonial display. Despachos are given as gifts from the heart; an action of honoring Mother Earth, the feminine spirits, and natural beings. 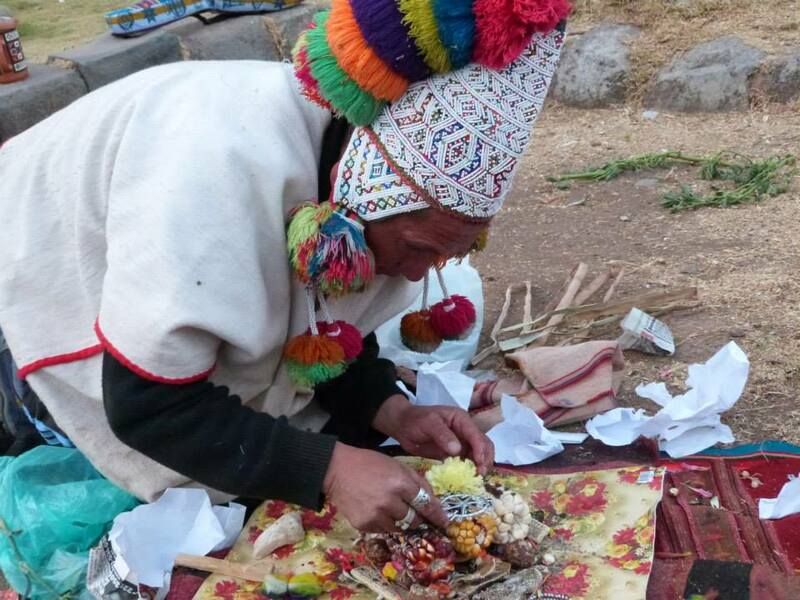 In this way, the Q’ero Paqos people are able to connect with their ancestors; for abundance; for healing; for celebrations; for initiations and other uses among the villagers. And this was the spirit in which our ceremony proceeded. How Is A Despacho Ceremony Performed? Prior to the ceremony, those participating are asked to prepare themselves. Although there are multiple ways to prepare, the purpose remains the same–to elevate one’s consciousness, and engage themselves to a higher state of presence. Some of the most effective ways to prepare for a despacho include meditation, relaxing music, prayer, walking through nature or cleansing with incense, tobacco or Palo Santo. The environment for which a Despacho ceremony takes place can take a few minutes to set up. The basic idea is to set a tone of respect–a sacred circle involving all participants. In the mountains of Peru, the people sometimes use rattles, flutes, or drums during a ceremonial chant, a meditative rhythm. 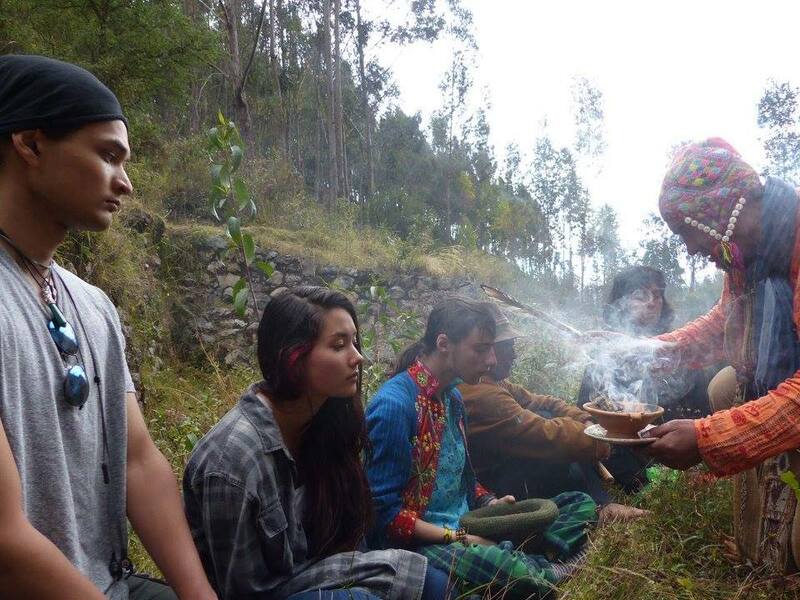 Despacho ceremonies are always performed outdoors, as it is an opportunity to commune with nature.The closer one can become to Mother Earth, the spiritual guides, and the sacred Apus, the more likely the spirits will become invoked and join their offering circle. The ceremony finally begins when one person (typically the leader of the ceremony) lays out a generous sized, piece of paper. The offerings are systematically placed on the paper, usually involving chanting. Our ceremony started with the traditional coca leaves. Cesar combined groups of three cocoa leaves, allowing each participant to channel their blessings into them, by holding them close to our hearts, then heads, then placing within the group. Then over the course of the next hour Cesar combined the offerings using a variety of ingredients into the paper wrapping. We each took turns with the blessing, often burning the traditional Palo Santo to signal the spirits of our intentions. A variety of ingredients were placed into the paper envelope including paper, shells, coca leaves, flower petals, corn, candies and cookies, spices,cotton, animal fat, streamers and confetti. Some of the other items used were a wooden cross, a petrified condor and a llama fetus. After the offering to mother earth was completed, Cesar gently placed the package into the fire. As the children of our shared mother Pachamama, all participants joined hands and felt our blessings received. There really is no ‘one’ way to invite the presence of all sacred aspects of the Pachamama, aloud or silently, together or by turn, but the people of the Andes have based their lives on the natural principles of expressed through the traditions of the Despacho ceremony. Since ancient times, most indigenous cultures have a connection to the spirit world and have traditions to expressing gratitude to the Sun, the Earth, the Wind–for they recognize, without them, all life would all perish into nothingness.